Since our November launch, we've published more than 30 web applications made from government records, including the most comprehensive public payroll database in the state, an interactive database with all 160,000 inmates serving time in the 100-plus state prison units, rankings of more than 5,800 public schools, a comprehensive list of every red-light enforcement camera in Texas, and databases with state-level fundraising and spending for members of the Legislature and statewide elected officials. Readers have viewed these pages more than 2.3 million times — more than a third of the site's overall traffic. From the beginning, we promised you data. 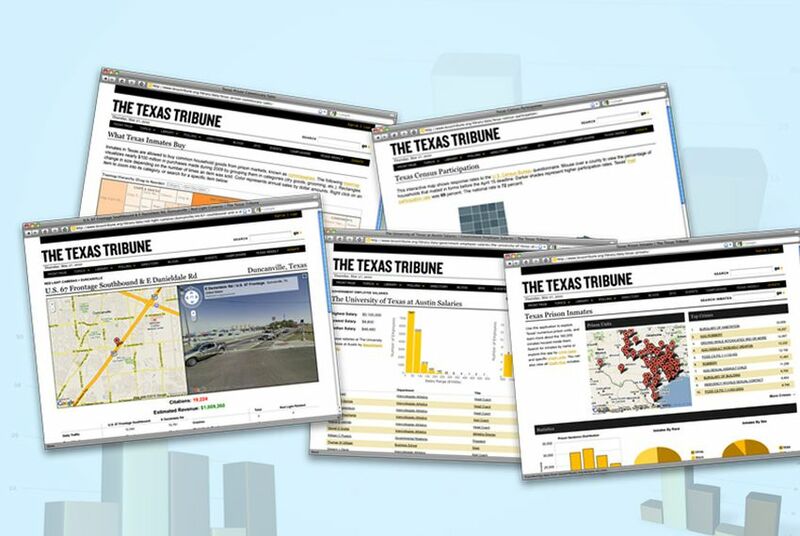 And since our November launch, the Tribune has published more than 30 web applications providing searchable access to 1.1 million government records, including the state's most comprehensive database of public payroll — where the government spends most of its money. Readers have viewed these pages more than 2.3 million times, accounting for more than a third of the site's traffic. Data have been long been used by journalists to add precision and context to their reporting. But making that information available to readers — in both raw formats and, more importantly, interactive applications — empowers Texans to dig through public records and documents themselves, and to organize and make sense of what they find. Publishing data is news. It aligns with our strategy of adding knowledge and context to traditional reporting, and it helps you and us hold public officials accountable. • Directory: A detailed listing of 242 elected officials in Texas, including all statewide officials and members of the Legislature and the congressional delegation. Officials' pages have their biographical, contact, political and social media information, as well as all the personal financial statements they've filed with the Texas Ethics Commission. Each legislative district also has a page with historic election results, PDFs of demographic and other data and an interactive map of its boundaries. • Texas Prisons: An interactive database with all 160,000 inmates serving time in the 100-plus state prison units. Users can navigate the data in multiple ways, including a state map, allowing them to see specific prisoners, but also statistics and details on crime types, units and counties where convictions occurred. • Government Employee Salaries: The interactive database has more than 600,000 public employees working at 62 of the state's largest school districts, universities, cities, counties and mass-transit operators. This is our most popular and controversial application. Here's why we publish it. • Education: Explore a school rankings database with academic performance and student demographic visualizations, or search the exemplary and lowest-achieving schools, and compare superintendents' salaries in the context of academic performance. • Red-Light Cameras: A comprehensive list of each red-light enforcement camera in Texas, with maps, Google Street View images and statistics about citations, crashes and revenue at each intersection. • Campaign Finance: We have several databases with state-level fundraising and spending for members of the Legislature and statewide elected officials. We haven't forgotten members of the U.S. Congress from Texas. We post their contributions (from both political action committees and individuals) and spending for the current election cycle. We've also broken out contributions and spending by candidates in the governor's race. • Elections: Get vote totals from dozens of 2010 primary election races, and see the results in interactive maps. Each state candidate is also listed in our 2010 directory. From data in our Library, we've published dozens of traditional and not-so-traditional stories, including what prisoners purchase in commissaries (with an interactive chart), U.S. census participation rates by county (with an interactive map) and the state's largest political campaign donors. We've also published stories about industry lobbying fights, third-party-funded travel by Texas members of Congress (with map) and an increase in ethics fines against elected officials in Texas. We're planning much, much more for this year and beyond, especially now that some elected officials are embracing open data standards and making more records available to developers online. We're planning to tackle lobby spending, with visualization, and make our campaign-finance apps more interactive and incorporated into officials' directory pages. Expect some ambitious projects related to the upcoming legislative session. We hope to have about 7 million records available to the public by year's end. Explore the Library, and let us know if you have feedback and suggestions.